A major beach resort, Pecatu sits on the southern peninsula of Bali. 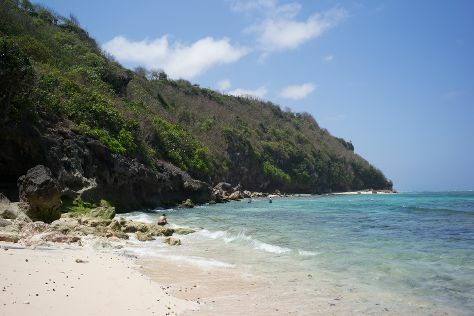 Your itinerary includes some good beach time at Bingin Beach and Dreamland Beach. Satisfy your inner culture vulture at Uluwatu Temple and Puja Mandala. You'll find plenty of places to visit near Pecatu: Nusa Dua (Bali Jetpacks and Water Sports, Waterblow, & more). There's more to do: stroll through Blue Point Beach and kick back and relax at JImbaran Beach. To see other places to visit, reviews, traveler tips, and tourist information, go to the Pecatu trip itinerary maker website . Cairo, Egypt to Pecatu is an approximately 16.5-hour combination of flight and taxi. Traveling from Cairo to Pecatu, you'll lose 6 hours due to the time zone difference. Traveling from Cairo in October, Pecatu is a bit warmer at night with lows of 28°C. Wrap up your sightseeing by early afternoon on the 10th (Wed) to allow time for travel back home.